It’s 6:30 pm and our children are in bed asleep. Blackout curtains and sound machines were invented for me. 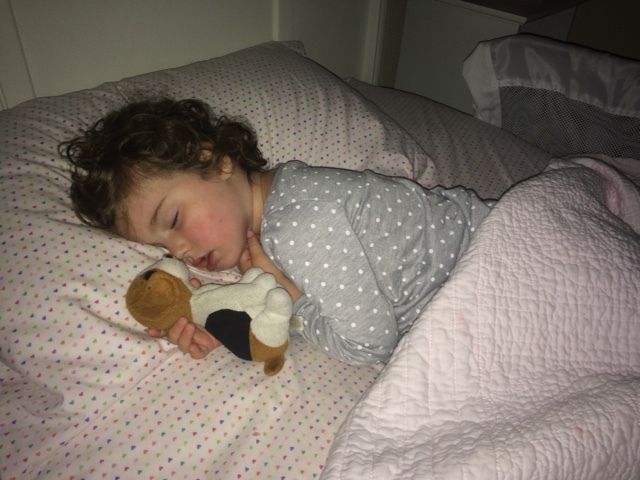 This article has been making the rounds the past few days about the benefits of an early bedtime (and the boys usually go to bed more than an hour earlier than their mentioned “absurdly” early bedtime). Sure, I could tell you that we put our kids to bed, umm, obscenely early because science says that it will make them healthier and smarter. Screw science. Let’s talk sanity. We don’t have the money or flexibility in our schedule to do a whole lot of self care. I don’t get massages. Ryan and I don’t do date nights. We don’t go on vacation. But I sure do covet my evenings with wine, adult television and conversation, and the choice to do something productive and responsible, or not. And silence. Glorious silence. I’m taking advantage of these jokers’ current inability to tell time and lack of evening activity commitments, because I know it won’t last forever. They are so darling when they are sleeping. 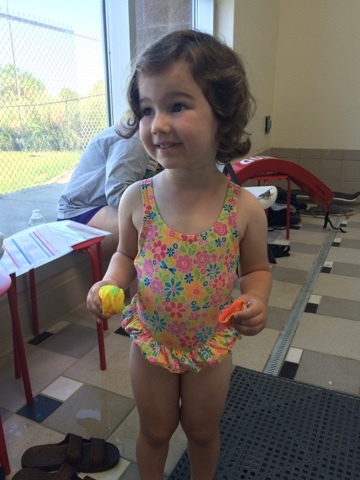 Yesterday was Charlotte’s second lesson with SafeSplash Swim School. Unfortunately, we had to miss last week due to Grayson being in the hospital, but it didn’t seem to slow our girl down one bit. 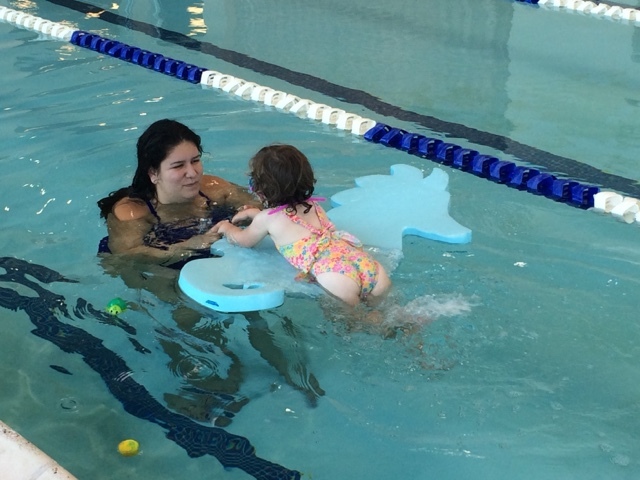 She was so anxious to get to the pool and she practically dragged me out the door. 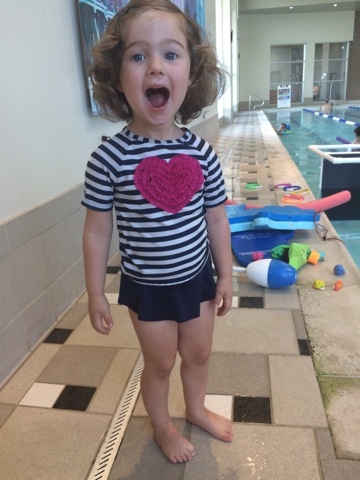 We got to her lesson a few minutes early, and she graciously gave me a sweet poolside pose, and then a silly one. This week, Charlotte did much better blowing bubbles (she actually put her face in the water) and loved throwing and chasing the little rubber toys on the pool noodle. 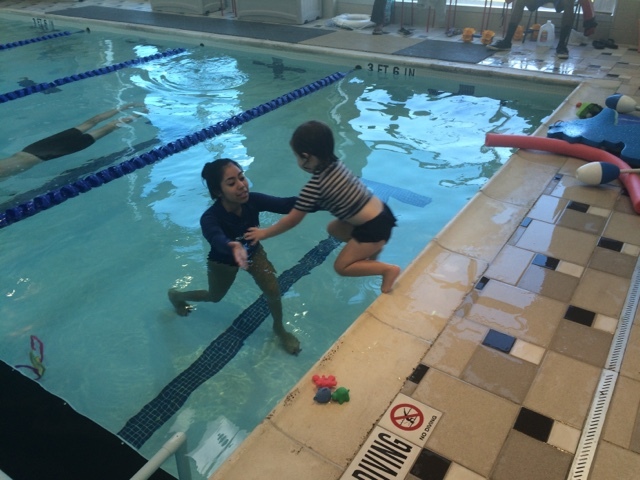 During the last few minutes of class, she practiced jumping off the side- she was fearless and loved it. She even went underwater a few times! 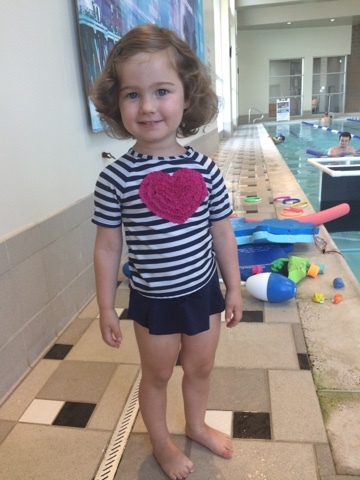 We are loving her lessons and can’t wait for the pool to open to try out her new skills! Although this post is sponsored, all opinions are my own. 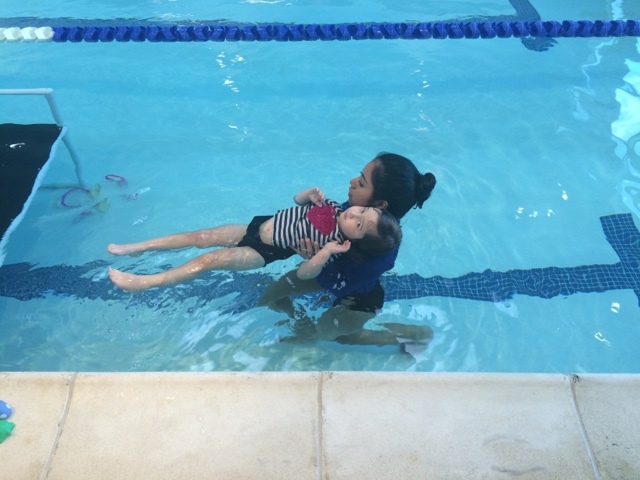 SafeSplash Swim School is providing a month’s swim lesson in exchange for blog posts. 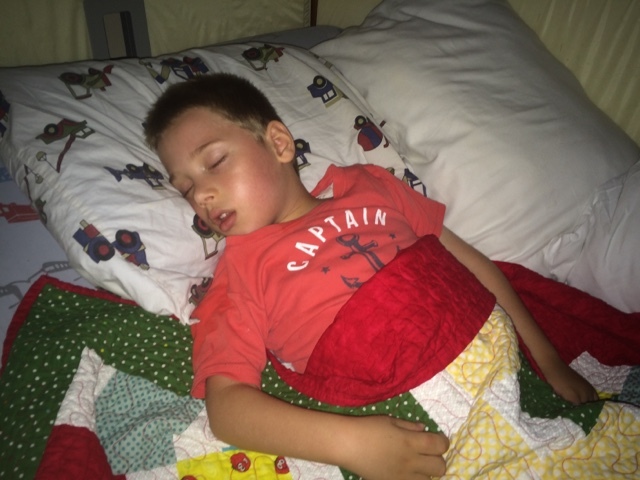 Last week, after I wrote this post, Grayson just wasn’t getting any better, so I took him to the ER. He was admitted to the hospital for one night, but thankfully bounced back quickly with fluids and rest and we got to go home the next evening. It had been months since we’d been in the hospital, and my body wasn’t used to it; I was absolutely exhausted the next day and my neck and back were sore from a night spent on a hospital couch. 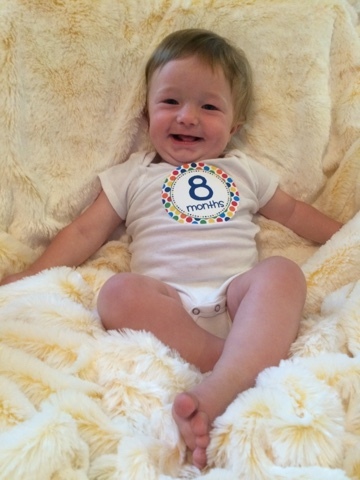 Despite this minor setback, good things are happening for Grayson, and I couldn’t be more thrilled for him. Hip, HIP Hooray! Thursday Grayson saw his orthopedic surgeon, who x-rayed his hips and said they look just as they should for a year post-surgery. We scheduled his second surgery for next month; he will have the hardware removed from the bone. 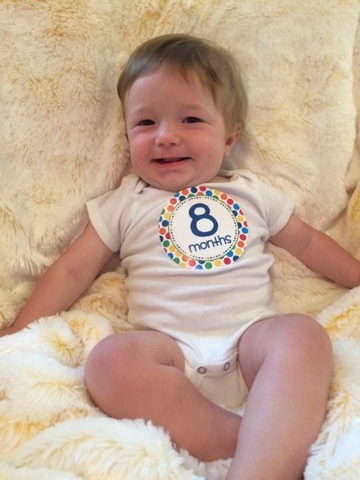 His doctor claims this will be super minor compared to last year- I hope he’s right. Kindergarten, here we come! This afternoon, we visited the school where Grayson will attend next year. This was definitely bittersweet, as he only has a few short weeks left at the school he has attended for the past 4 years. We have had a lot of reservations and fears about sending him to public school, but honestly, after today, I’m super excited for him. 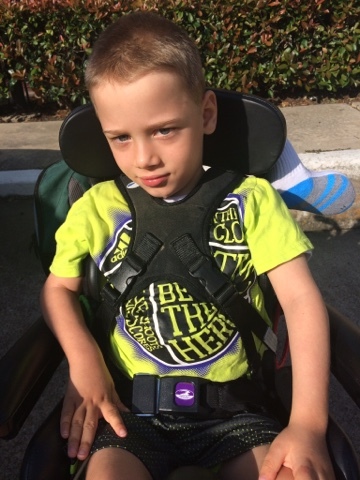 We met with the Life Skills team and diagnostician for over an hour, and they asked lots of questions about G, and were genuinely interested in him. We saw the classrooms as well as their sensory room and motor skills room. And as we were leaving, I got to chat with one of the APs at the school who I happened to work for 8 years ago, my first year teaching junior high. We used to pray together in my classroom before school, and it makes me feel good that there will be someone I know in leadership at the school where G will be next year. Wishes do Come True Grayson’s Make A Wish project is about to happen! He is getting a flagstone patio and awning so he can hang out in the backyard with us under some shade. The project has been approved; now we just need to pick out the flagstone and awning colors. We are so excited and can’t wait to see G in his new space! I’m so proud to be this guy’s mom, and feel overwhelmingly grateful that his future looks so bright. Another Mothers Day has come and gone, and while it was good (sweet cards and gifts from my family, church, and dinner with extended family), it wasn’t exactly relaxing. Grayson has had two really rough nights- he’s gagging and retching like crazy and last night just cried and cried in my arms until he fell asleep. I’m so thankful he is a lot better this morning, although he definitely still isn’t himself and his “voice” sounds absolutely awful from all the gagging. I think in some ways I’ve taken for granted how healthy G has been for so long. A year ago he was in the hospital recovering from his hip surgery, which were some of the hardest days of his life, both for him and me. But since then, things have been relatively smooth for him. 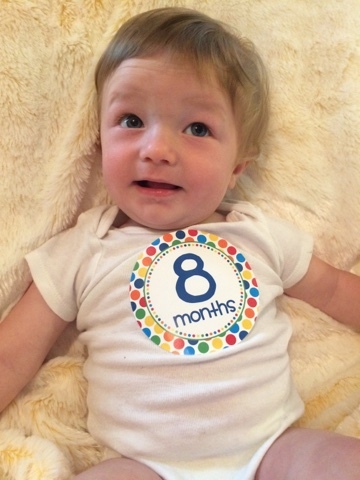 Since life has been so jam-packed with a new baby and moving, the severity of Grayson’s disease and what it is doing to his body often gets pushed to the back burner of my mind. But last night, holding his broken, retching body forced me to focus on the awfulness of his disease. At one point I had him calmed down and his legs were relaxed under my right arm. He fell asleep and I relaxed a bit too and shifted my body. That one small shift immediately caused his muscles to contract and his whole body stiffened and the painful crying and retching started again. I felt so helpless; all I could do was rock him and kiss his face until he was able to relax again. I held him for a long time, and was overwhelmed by the fragility of his body- his legs and arms have become so, so skinny and stick-like, and it’s hard to cradle his hips and feel the metal holding his bones in place. 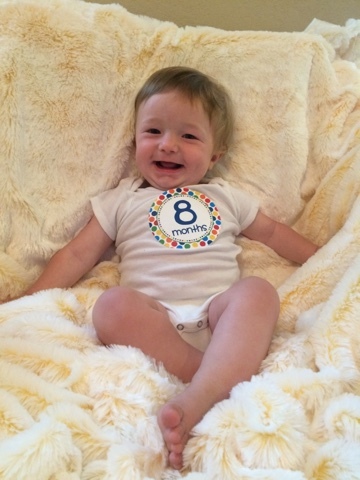 I know we are lucky- Grayson is here, and knows how much he is loved. 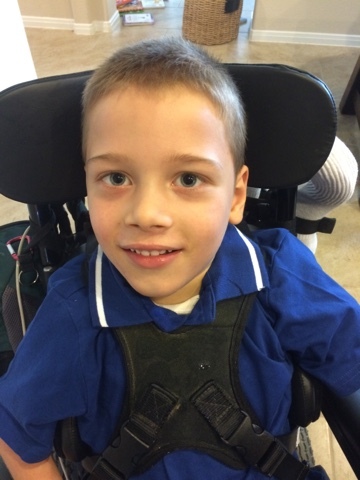 Right now he requires relatively few medical devices to keep him alive. He is able to go to school, church, and anywhere else we want to take him. He can listen to and be soothed and entertained by music, and even some TV. He laughs. But he’s sick, and his body fights against itself every single day. It’s such a hard balance- trying to cherish and not take for granted every single day we have with Grayson, while at the same time living our “normal” busy life with two other children. Juggling these two realities makes me so thankful that we are done building our family. 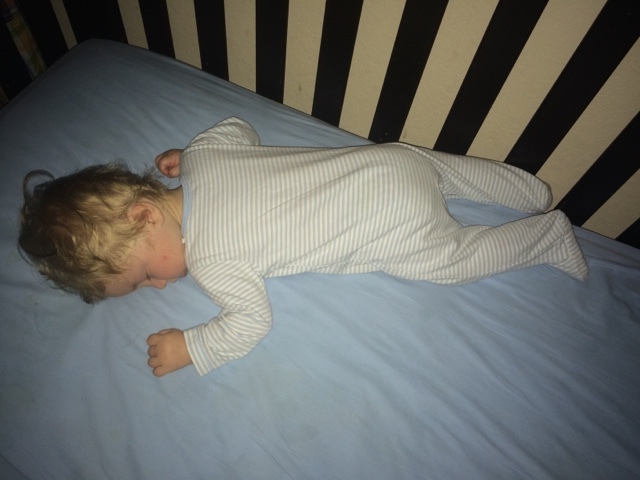 Today on Houston Moms Blog, I wrote about this and how my heart and head are now in agreement about closing our baby-making chapter, although I didn’t really get into the huge impact Grayson’s situation made on that decision. Thanks for reading. Summer is quickly approaching (yay!) and we have big plans to spend a lot of time in the water. 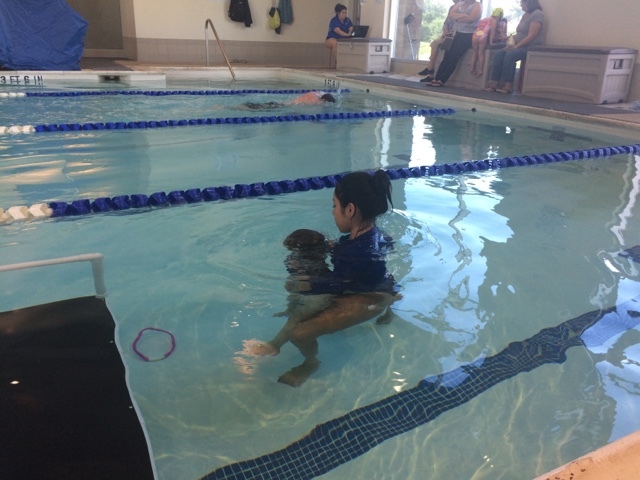 For the past few years, we haven’t had easy access to a pool, so Charlotte hasn’t had a lot of exposure to water or swimming. 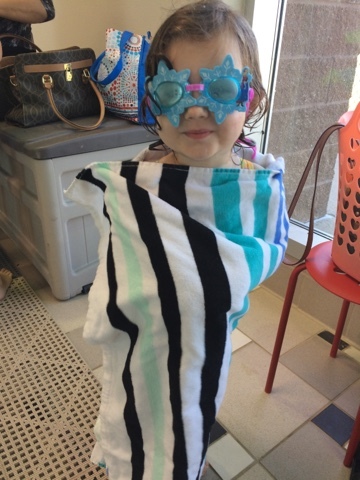 Honestly, I’ve felt a combination of nervousness and guilt about this and knew I needed to get her into swim lessons ASAP so she wouldn’t be behind in this crucial life skill. We are living back in the suburbs now, and our neighborhood has a pool. My parents also just had a pool built with an awesome waterslide at their ranch in East Texas and I’m hoping for hours of fun in the pool with the cousins this summer. It will definitely be a lot more fun if I have at least one kid who can swim. 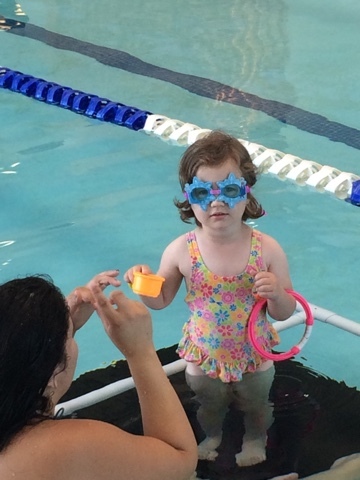 Today, Charlotte had her first swim lesson at SafeSplash Swim School, at the Katy location. It’s only about 15 minutes from our house (excellent for this so-tired-of-driving-an-hour-to-get-anywhere mom). They have locations all across the country, so check their website to see if there’s one near you if you are looking for a place to take your kids for lessons. There was a little mix up in the schedule/registration process and Charlotte wasn’t on the roster, but the staff was SO nice and accommodating and fit her right in. Her teacher, Ms Amanda, chatted Charlotte up right away and won her over with her mutual love of Ariel (Charlotte said she was her favorite princess, and of course that was the correct answer because she’s the one who swims). Amanda helped Charlotte put her Frozen goggles on, which are ON POINT, amiright? I really didn’t know if Charlotte would willingly go in the water, but she wasn’t timid or reluctant at all. She did everything Amanda asked her to and learned how to kick, blow bubbles, and safely exit the pool. 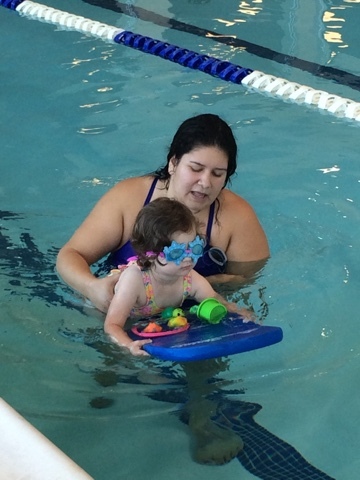 She loved the kickboard and playing with the little water toys. The lesson lasted 30 minutes and Charlotte did not want to leave and asked me in the car when she gets to go back. 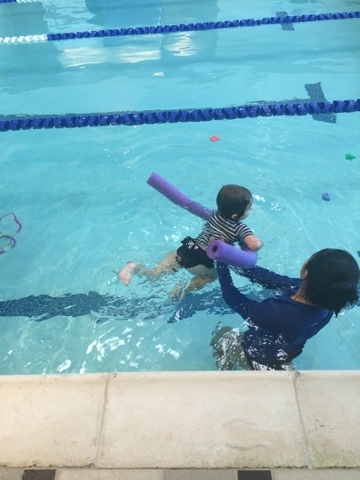 I’d say this was a huge success for a first swim lesson! I was so impressed with the staff and the facility (this location is inside LA Fitness so we had access to their locker room to change). It was a great way to end a busy day and I’m really looking forward to watching her progress! Although this post is sponsored, all opinions are my own. 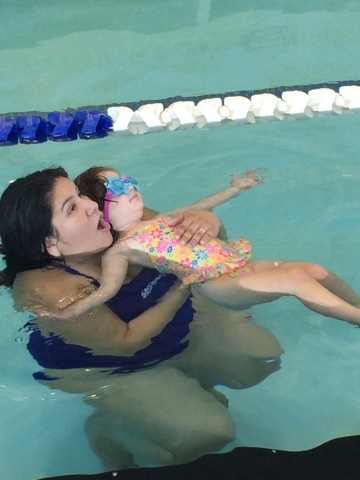 SafeSplash Swim School is providing a month’s swim lessons in exchange for blog posts. You have really started coming into yourself the past few weeks, and I am so enjoying watching your cute little personality emerge. You are SO much happier now that you are mobile, and although it’s made life just that much busier, we are all much happier too. You are into absolutely everything right now, and are army crawling at a quite impressive speed. You will be crawling any day now- you are so, so close to getting it. You still hate to sit up, and even though you can do it, you are rarely willing to. You arch your back and push up to a standing position with your legs. This makes it challenging because it means you never stay in one spot. Ever. Are eating solids once, sometimes twice a day. I’m being very relaxed about it. You haven’t rejected anything and have had avocado, banana, chicken, oatmeal, yogurt, and some baby food. You really love scrambled eggs with cheese. Nolan, you have the best smile and the most infectious laugh. We all adore you and are so glad you are a part of our family. 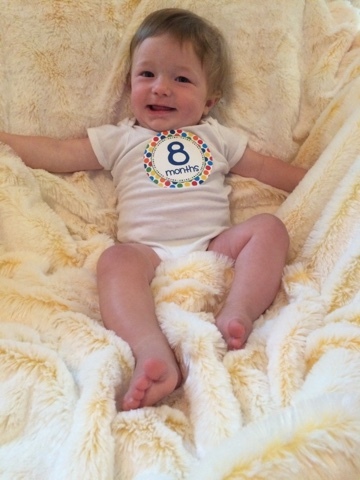 Happy 8 months!